Howard Mansfield On "Dwelling In Possibility"
Mansfield has spent his literary life writing stories that connect people to the land where they live. In his latest book, he explores the idea of one’s ‘dwelling’… from mansions to condos to sheds and how, as he says, ‘they succeed or fail to shelter us…body and soul”. 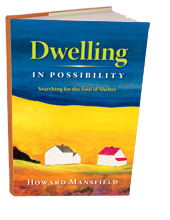 Howard Mansfield: Noted New Hampshire author, whose latest book is “Dwelling In Possibility”. *Howard will be speaking and reading from his book this Saturday at the Toadstool Bookshop in Peterborough at 11:00 AM. Wednesday, October 2nd, 7:00 p.m.
Wednesday, October 9th, 7:00 p.m.
Wednesday, October 16, 7:00 p.m.
Thursday, November 14th, 7:00 p.m.